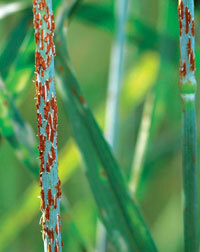 STEM rust that ruined wheat crops in several Asian countries last year is still invincible. Scientists say it has established itself on nearly all resistant wheat varieties developed in the last 50 years. There is no way to control this highly adaptive pathogen, dubbed Ug99. What makes the fungus elusive is that it can’t be grown in lab conditions; it grows only on living tissues. This makes it difficult to study its invasive mechanism and the way it adapts to resistant varieties of crops. An international team of scientists, led by Francis Martin of the National Institute of Agricultural Research in France, recently sequenced the genome of two such rust fungi—Puccinia graminis f. sp. Tritici that causes stem rust in wheat and Melampsora larici-populina that blights the leaf of poplar tree. They compared the possible proteins these fungal genes could produce and found they contain a large number of effector proteins. These proteins have the capability to suppress the defence system of plants during infection. This could be the reason plants are so vulnerable to the pathogen. Analysis of the proteins also suggested that the fungi are unable to assimilate nitrogen, sulphur and other amino acids present in the culture medium in lab. A large number of genes present in these fungi also indicate they easily adapt and evolve with their hosts, the team noted in Proceedings of the Nati-onal Academy of Sciences published on-line on May 2. They hope understanding the interaction between the host and parasitic pathogen could help combat this formidable enemy of agriculture and silviculture.